Tasting Notes: Rich flavours of cassis, dried cherry and plum with bright notes of raspberry are prominent in this finely balanced ice wine. Caramel notes round out the long finish. On the Nose: Dried cherry, apricot and sage, liquorice and lemon zest. On the Palate: Bright raspberry with blackberry, lemon zest and delicate caramel spiced with nutmeg. Long smooth finish, with sweetness balanced by a spine of bright acidity. Luscious! Food Pairing Notes: The Cabernet Sauvignon Ice Wine is equally at home served with appetizers or desserts. 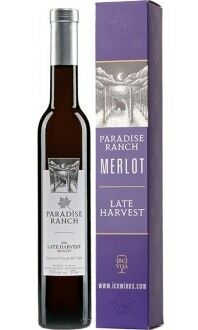 This wine is divine paired with dark chocolate, tart cheesecake and before dinner with soft ripe cheeses and rich pates.